Pearl Knotting Seminar | Metalwerx, Inc. This class is a wonderful opportunity to learn from a true expert in the pearl trade: Mary Stachura of Joseph Stachura, Inc., gemstone dealers who are regulars at Metalwerx's Vendor Day. 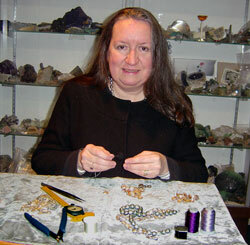 Mary has traveled the pearl-producing countries of the Far East for more than 20 years. Beautiful pearls are her passion--one she loves to share with others. The focus of this class is to learn proper knotting technique and termination methods. We begin with an overview of the types and shapes of pearls: freshwater, saltwater, cultured, natural, Akoya, South Sea, Tahitian, etc. The variety and treatments are seemingly endless. We will then present a checklist of how to buy a good strand of pearls and how to spot fakes. From there, we'll discuss proper care of pearls. During class, you'll learn several termination methods: crimping (yuck! but sometimes necessary), attaching to a clasp using a bead tip, attaching to a clasp using French Wire/bouillon [a delicate metal coil that protects the silk at the end of the strand -- it's like a tiny slinky). You'll learn how to create an endless necklace (no clasp at all). We'll also discuss design possibilities and challenges. During the class you will have an opportunity to purchase a wide variety of pearls, directly from Stachura, Inc.'s extensive inventory. For 18 years, Mary Stachura is one of the partners in the firm, Joseph P. Stachura, Co., located in Uxbridge, MA. Stachura specializes in selling natural gemstone material and pearls. She travels to Japan, china, India, Taiwan, Thailand and Sri Lanka to bring the best material to her clients. Mary states, "I have always been attracted to pearls - any type of pearl. We are fortunate now to have an unequaled range of pearls - Japanese, Chinese, South Sea, Tahitian; freshwater, saltwater, and natural. I have travelled to many countries in Asia in the past 20 years. And pearls have always called my name and tuged my sleeve from across a crowded room. Pearls have a natural and unequaled beauty; nothing quite compares to their smooth skin and perfect density." There is a $55 materials fee, which is payable directly to the instructor at class. The kit includes silk, beading tweezers, beading needles, glue, bead tips, clasps, nippers and freshwater pearls. If students have taken this course before and would like to supply their own materials, please make a note in the comments section upon checkout, or contact Metalwerx at 781.891.3854. You are welcome to bring any of the items above with you to class. Do not bring glass beads, as they are not appropriate for beginning stringers. If you have any questions, you can email Mary at or call 508-278-6525. If you are bringing your own pearls, please bring freshwater pearls that are 4mm or larger. While you can knot with any type/size of pearl, these will have more consistent holes and the overall size will be easier to work with as a beginner. I absolutely loved this class, and I feel it will help me take my work to a new level and explore new areas of craft. I enjoyed meeting and talking with so many talented artists, including the staff and interns at Metalwerx. I hope to return for a future workshop!